Both sexes:Small, brown finch with red forehead and black bib. Redwings are smaller than the Song Thrush with red flanks and a prominent yellow stripe above each eye. The upperparts are olive-brown, while the underparts are pale buff with dark spotting on the breast and belly. The flanks and underwing are reddish. Above each eye is a bold pale whitish or yellowish eyebrow (supercilium). Juveniles have buff-coloured spots on the back. In flight, the red underwing is most noticeable. Flocks of Redwing can usually be heard, calling "tseep", on a winter's night as they migrate. Their song is a variable warble, which we are unlikely to hear as so few breed in Britain, but their sub-song can sometimes be heard, particularly when in flocks. 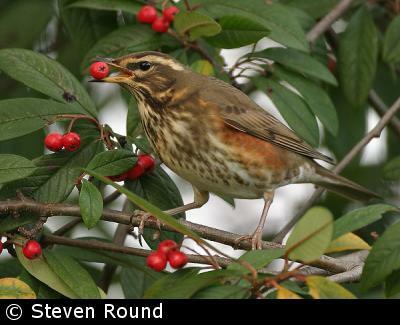 Redwings feed on insects, worms, snails and slugs, fruits and berries. Soft fruit, especially fallen apples, and plants bearing berries, such as Hawthorn, may attract Redwings in to the garden. A few breed in Northern Scotland. They nest in trees, bushes, tree stumps, and banks. The cup nest is made of twigs, grass, moss and lichen, and lined with mud and grass. The female lays and incubates eggs that are smooth, glossy and light blue or greenish-blue with reddish-brown speckles. The eggs are about 26 mm by 19 mm. Both parents feed the young after they have hatched. The Redwing is a small winter visiting thrush from Scandinavia and Iceland, usually arriving in late September and staying until March-April. The Scandinavian birds usually winter in southern Britain and the Icelandic birds in Scotland and Ireland - the Icelandic birds are slightly larger and darker than the Scandinavian birds. In the UK, the Redwing is a Red-listed species of conservation concern owing to the small number of breeding pairs.